QUALITY: We try to only take in quality firearms only. Any firearm that appears to be modified (trigger mods, frame mods such as stippling & undercutting, or non factory cerakote) or has known problems with reliability we will not take it in. I do not accept any individual built or local gun shop built AR's. I only take in AR's that are factory made by well known companies. I do not take in every firearm that walks in the door (this does not always apply with estate collections). I am looking out for myself and my customers. Even though these are sold with no warranty we are not going to sell junk. Many firearms we take in are new and never fired. We WILL NOT sell these as new like many shops do. They will be considered used and sold as such. 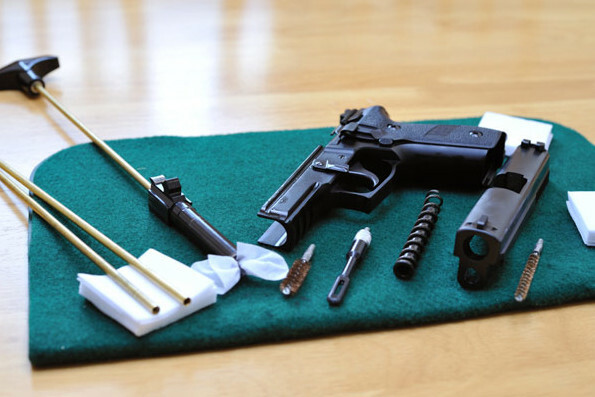 We take apart, clean, and inspect almost (some never fired so there is no need) every firearm that is taken in. We don't charge extra just because the firearm is cleaned. We buy or trade 75% of the firearms that come in the door. I have had customers bring guns to me that have purchased used from other local dealers and want me to fix them although I am not a gunsmith. Most of them have clearly never been cleaned and inspected. One had rust in the action causing it not to work. We try to do our best at stocking quality used firearms at a fair price. We do not take in Kimber firearms. Why? I had used Kimber handguns that were traded in and a few had issues. On one particular firearm I told the customer to call Kimber and he received less than satisfactory service. So I called. They told me that the customer would have to spend I think it was 200.00 to have the firearm reconditioned with new springs and possibly other hardware before they would look at any problems the firearm may have. The gun was only 4 years old. How many guns do you have that are more that four years old and still work? This turned me off to Kimber so I will never take a used Kimber in again. Stoeger / Benelli - I am not a dealer for this manufacturer so I do not deal in the used models. PERFECT / AS NEW: In New condition in every respect. (Jim's note - in my experience, many collectors & dealers use "As New" to describe this condition). GOOD: Some minor replacement parts; metal smoothly rusted or lightly pitted in places, cleaned or re-blued; principal letters, numerals and design on metal legible; wood refinished, scratched bruised or minor cracks repaired; in good working order. FAIR: Some major parts replaced; minor replacement parts may be required; metal rusted, may be lightly pitted all over, vigorously cleaned or re-blued; rounded edges of metal and wood; principal lettering, numerals and design on metal partly obliterated; wood scratched, bruised, cracked or repaired where broken; in fair working order or can be easily repaired and placed in working order.